This is a 2 Gauge Kit for the 1995-2000 Chevy 6.5L C/K Trucks. 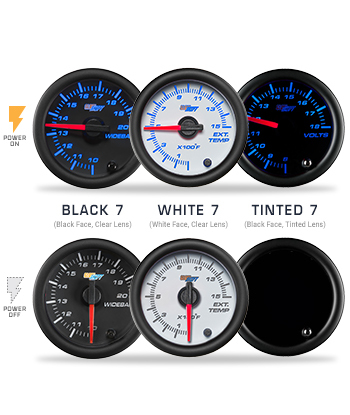 GlowShift’s Custom 7 Color Series Gauge Package allows you to select (3) 2 1/16" (52mm) gauges from our Black 7, Tinted 7 or White 7 Color Gauge Series, as well as including a vehicle specific triple pillar pod to mount the gauges to your factory A-pillar. Each electronically driven 7 Color Gauge utilizes electronic sensors and probes, as well as stepper motor technology to ensure extremely smooth needle movement and accurate gauge readings. 7 Color LED through dial lighting allows you to change the color of your gauge to blue, green, red, teal, white, purple or yellow and the color recall feature will remember the color the gauge was on prior to powering your vehicle down. Connecting your gauges to your headlight switch will allow the gauge to dim 30% for easier gauge monitoring during the night. GlowShift includes all sending units, mounting hardware, installation instructions, as well as free lifetime technical support and a one year limited warranty with each Custom 7 Color Gauge Package purchased.